I loved the hotel...room, etc...but there was a couple having a violent fight at 2 am... I could not find a way to call the front desk from the phone in the room. Loved the location, easy access to subway, would choose this again! Very helpful staff. Breakfast was great at the self serve area. Overall, a nice place. The rooms are small, as expected when you put a hotel in an established building with a limited amount of space to work with. 2 things that were odd - no sort of drawer space so some stuff had to stay in the suitcase, to be hauled out when needed; and the top shelf in the closet is accessible only if you're an NBA player. In contrast the shower head is a little low, but the water pressure was among the best I've ever had in a hotel. Great, walkable neighborhood near many things you'd like to see/need. I always have a great time when i go to Aloft Brooklyn. Rooms are always clean, staff is friendly, and I love their happy hour! Hotel location is closed to major subway stations. There is a rooftop bar and it’s too much noise during the late hour. Nice hotel, close to shopping and transit system. If you have a car rental, parking can be very expensive. Paid $25 a night for parking. Wish hotel could find lower parking rates for visiters with cars and rentals. Other than that parking expense the hotel is nice to stay at. Great location and great room. I especially like how you can easily make the room completely dark so you can sleep all morning. I love the food mart open 24 hours. Highlight of my stay was the excellent housekeeping! The staff waiting until my late checkout (wasn't knocking on my door every 5 minutes), greeted me, and then offered me a water for my travels! Such a small thing, but she went above and beyond and was incredibly friendly. Front desk staff was fine, elevators were clearly under construction, room was clean and comfy. Overall, I'd stay again. Hotel rooms were spacious which is unusual for NYC. Close to several shops, restaurants and subway stations. Staff were very helpful. When we got there our room wasn't ready so they offered upgrade to a suite. We took the upgrade but the room was freezing because the heat was off. We would have to wait hours to get the normal temperature so We waited at hotel lobby so we can get the room we originally booked. Too many issues as for New Years where you pay so much for the hotel. Despite the handicap shower I did not request when purchasing, the hotel stay was great, staff were friendly, inviting atmosphere, check in/out easy. 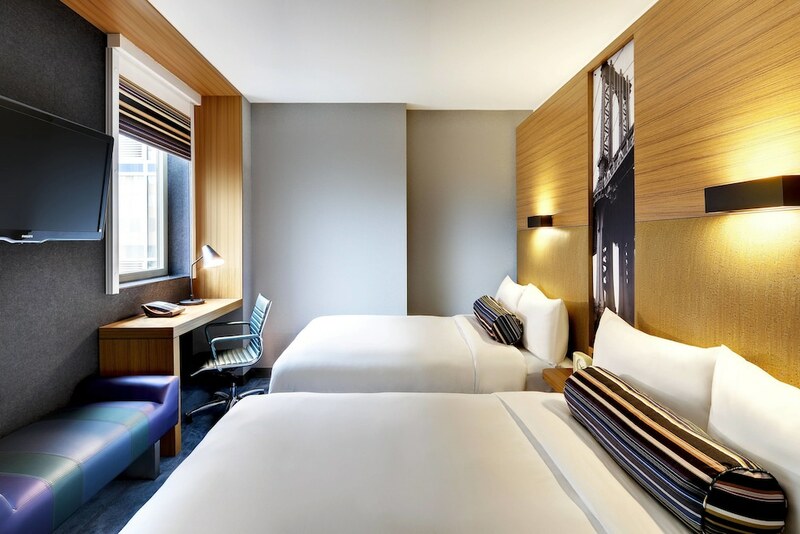 Located in Downtown Brooklyn, Aloft New York Brooklyn is within a mile (2 km) of popular sights such as Barclays Center Brooklyn and Brooklyn Bridge Park. This 176-room, 3-star hotel welcomes guests with conveniences like an indoor pool, free in-room WiFi, and a fitness center. Start weekdays with continental breakfast, available for a fee from 6:00 AM to 10:00 AM. Order from room service to satisfy your hunger without leaving your room, or explore the hotel and get a beverage at the bar/lounge or coffee shop/café. A 42-inch LCD TV comes with digital channels, and guests can stay connected with free WiFi and wired Internet. Beds sport Egyptian cotton sheets and the bathroom offers a rainfall showerhead, a hair dryer, and designer toiletries. Other standard amenities include a refrigerator, a coffee maker, and free newspapers. Guests staying at Aloft New York Brooklyn enjoy an indoor pool, a fitness center, and free WiFi in public areas. Valet parking is available for USD 50 per night. Multilingual staff at the 24-hour front desk can assist with concierge services, luggage storage, and dry cleaning/laundry. Additional amenities include a conference center, a 24-hour business center, and coffee/tea in a common area. Continental breakfast is served on weekdays from 6:00 AM to 10:00 AM for a fee. Refuel - Restaurant and bar specializing in American cuisine. Open daily for breakfast, lunch, and dinner. Kid's menu available. Recreation features at Aloft New York Brooklyn include an indoor pool and a fitness center.